I had no idea what to expect upon sitting down to Your Name and the first few minutes definitely had my head spinning. We’re ushered in via the voiceover narration of two high schoolers we’ve yet to properly meet in Mitsuha (Mone Kamishiraishi) and Taki (Ryûnosuke Kamiki). They speak about dreams as a rare comet shoots across the blue sky. It’s cryptic, beautiful, and utterly fascinating—a subdued tone easing us in before a kinetic collage of vignettes without context replaces it, a Radwimps rock anthem blaring about love. This shift to music video interlude proves jarringly abrupt; its culmination marked by Mitsuha awakening from slumber a wonderful splash into the deep-end of this anime’s high concept romantic fantasy. My disorientation continued because this girl didn’t seem herself. Without warning, logic, or exposition beyond those opening lines of esoteric prose, we suddenly realize the person onscreen is Taki trapped within Mitusha’s body. The signs are obvious like countless other Freaky Friday switcheroos: the initial moment of shock, confusion about gender-specific anatomy, amnesia-like symptoms when encountering family, and the shriek of realization inevitably supplied by the reflective glass of a mirror. And in one of the most inspiring maneuvers of a film so familiar and yet so unique, writer/director Makoto Shinkai jump cuts to the following day without a hint of passing time. Our bearings are only found when Mitusha’s grandmother (Sayaka Ohara) and sister (Kanon Tani‘s Yotsuha) exclaim how she’s back “to normal” after a wild yesterday. It’s a subtle shift foreshadowing numerous fast-forwards and rewinds, the murmurs of classmates, friends, and loved ones forcing Mitusha and Taki to believe what they’re experiencing is real. The fact it continues happening assists this acknowledgement as the other’s life becomes as authentic as theirs: her country girl learning the art of kumihimo within the lakeside town of Itomori and his urban boy in Tokyo holding architectural aspirations sustained by a wait-staff job at a fancy restaurant. They embrace their contrasts and ignore rules they set forth through smartphone diaries to not alter the other’s relationships, enjoying their daylong sojourns through different worlds without inhibition. But when everything starts making sense, it stops. We began watching Mitsuha and now we’re left with Taki. Was it all a dream? Shinkai’s film opens up from cute stranger-in-a-strange-body antics and expands into a philosophical and metaphysical parable about fate. We learned about Mitsuha’s family lineage to discover she might not be the first to dream of another’s life, so we hope she exists somewhere out there. 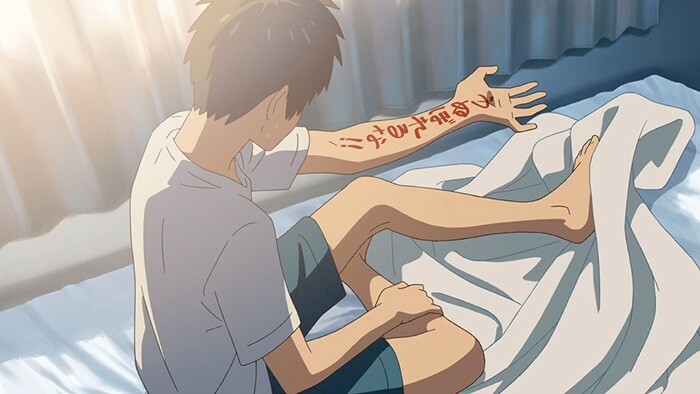 Attempts by Taki to contact her receive “this number is out of service” and suddenly he’s left with nothing but drawings of what he remembered. His crush on a coworker (Masami Nagasawa‘s Ms. Okudera) cools as he yearns to see Mitsuha again, a journey to the countryside commencing to find her so recognition can spark a whirlwind romance destiny has set before them both. But it all starts to fade: names, places, and experiences. The notion he imagined everything becomes a logical possibility. Thankfully logic has nothing to do with Your Name. as it refuses to adhere to preconceived notions of genre or reality. The comet comes into focus as a critical piece to the puzzle and shades of The Lake House (itself a remake of South Korean film Il Mare) enter. I don’t want to give too much away, but the first half’s dense exposition all proves relevant during the second whether trusted friendships (Mitsuha with Ryo Narita‘s Katsuhiko and Aoi Yuki‘s Sayaka; Taki with Nobunaga Shimazaki‘s Tsukasa and Ms. Okudera), family (Mitsuha’s grandmother’s shrine and father’s stubbornness as Mayor), or dreams within dreams connecting everything by time and space. They have a chance to accomplish something amazing—something that may guarantee they never see or remember the other again. There’s fantastic humor in how these teens react to their predicament, surprisingly effective montages to speed up time (all set to the Radwimps, who also scored the film), and emotionally heavy themes about love, loss, and sacrifice. It’s all “musubi” as Grandma Miyamizu would say, strands of life coming together in a knot like her kumihimo braids. The detail is impressively expansive as you discover yourself searching each frame for one of Mitsuha’s ribbons or signs of meaning in the introduction of kuchikamizake and old drawings of past comets’ splendor. What began so full of life soon buckles under the weight of immense tragedy, but we never relinquish our optimism. We’ve watched Mitsuha and Taki grow and mature knowing a power greater than fate still exists. Because even though they’ve been thrust together on this journey that reveals itself to be much more complex and impossible than mere body swapping, they still have free will to change its ending. Fate forces them to accept their lives by giving meaning and appreciation to what they have just as it introduces the dream of a potential future awaiting them. But fate also seeks to render that dream futile—a window into fantasy deemed unworthy of fruition. Somehow, someway a supernatural magic forever nameless beyond notions of faith steeped in ritual and the past arrives to promise hope. It transforms this lark into a deeply felt race against time wherein the characters must conquer their fears (multiple times) to attempt their miracle. And it’s an exhilarating ride. The animation is superb with cinematic moments of scale presenting their two worlds as equals. One moment of imagination even shifts towards a textured pastel aesthetic that awes in its attention to detail and gorgeous preservation of a human animator’s touch. The film was therefore Japan’s highest grossing release of 2016 for good reason: its success a testament to its visual, emotional, and intellectual excellence. I never once found my focus drifting because the meticulously-timed reveals ensure you know just enough to lean closer and not enough to think you have the jump on where it all will lead. Even its saccharine epilogue unfolds with care and authenticity, once again flawlessly allowing hope to shine above concrete answers via expert skill and nuance. 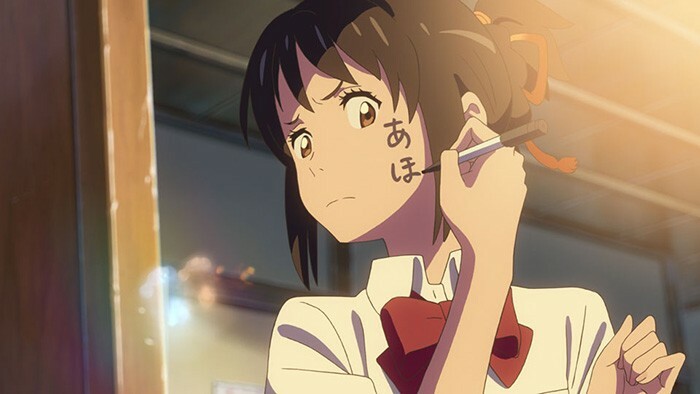 Your Name hits limited release on Friday, April 7th. 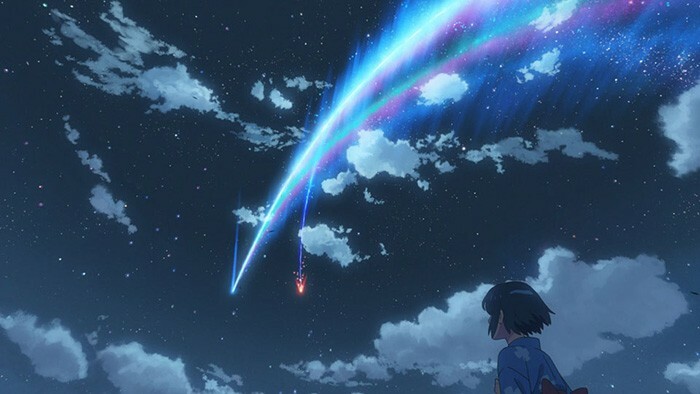 See More: Aoi Yuki, Kanon Tani, Kimi no na wa., Makoto Shinkai, Masami Nagasawa, Mone Kamishiraishi, Nobunaga Shimazaki, Radwimps, Ryo Narita, Ryûnosuke Kamiki, Sayaka Ohara, Your Name.